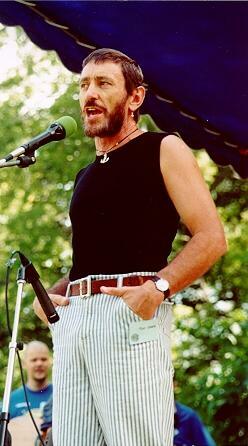 Bryan's poem was inspired by Tom's performance at the 1998 Home County Folk Festival (above), in London, Ontario. The poem and picture were officially presented to Tom at his March 1999 performance at the nearby Cuckoo's Nest folk club. The poem is reminiscent of the song 150 Days Out From Vancouver, by Tom and C. Fox-Smith. Can't you hear all the audience rising up to it ? And his squeeze-box is calling "Hey, row buddies row!" Of a life that he left to become a Folk Singer. Writing songs of the sea and the free-roving man. Been becalmed with loose sails out in the Atlantic. 'twas a cold icy dip down at McMurdo Sound. With that horny dog Bunts and a stoker called Daisy ! On hard-tack and rum, dancing jigs till the dawn. With stories of old and a life that's no longer. But keep his bows clear of that daughter of mine ! As you each get the feeling, he's a winking at you. Now he's packing his squeeze-box, he's ready to go . . .